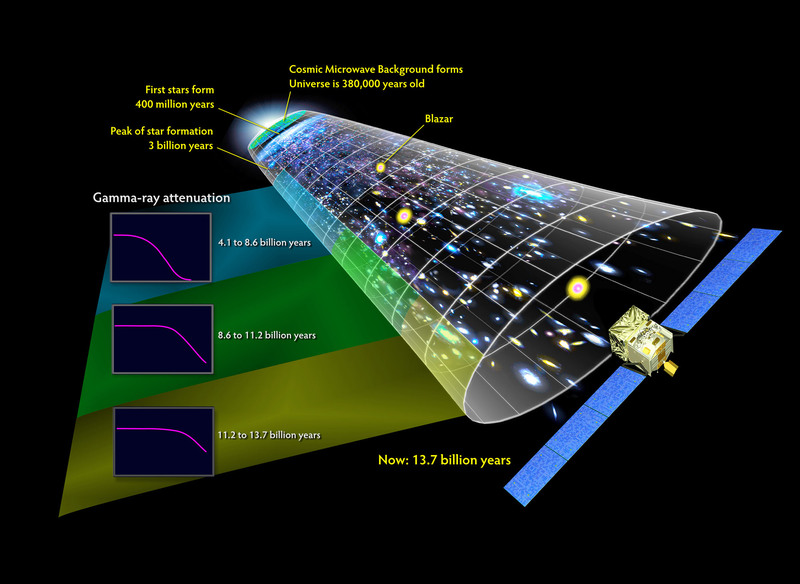 Using data from NASA’s Fermi Gamma-ray Space Telescope, a team of astronomers have made the most accurate measurement of starlight in the universe and used it to establish the total amount of light from all of the stars that have ever shone. 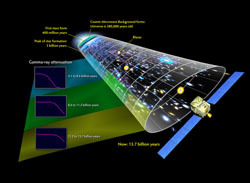 “The optical and ultraviolet light from stars continues to travel throughout the universe even after the stars cease to shine, and this creates a fossil radiation field we can explore using gamma rays from distant sources,” said lead scientist Marco Ajello, a postdoctoral researcher at the Kavli Institute for Particle Astrophysics and Cosmology at Stanford University in California and the Space Sciences Laboratory at the University of California at Berkeley. Gamma rays are the most energetic form of light. 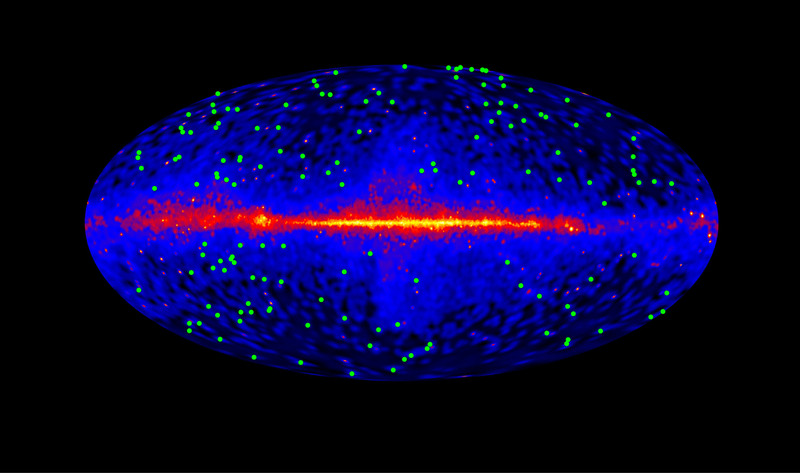 Since Fermi’s launch in 2008, its Large Area Telescope (LAT) observes the entire sky in high-energy gamma rays every three hours, creating the most detailed map of the universe ever known at these energies. “With more than a thousand detected so far, blazars are the most common sources detected by Fermi, but gamma rays at these energies are few and far between, which is why it took four years of data to make this analysis,” said team member Justin Finke, an astrophysicist at the Naval Research Laboratory in Washington. As matter falls toward a galaxy’s supermassive black hole, some of it is accelerated outward at almost the speed of light in jets pointed in opposite directions. When one of the jets happens to be aimed in the direction of Earth, the galaxy appears especially bright and is classified as a blazar. Occasionally, a gamma ray collides with starlight and transforms into a pair of particles — an electron and its antimatter counterpart, a positron. 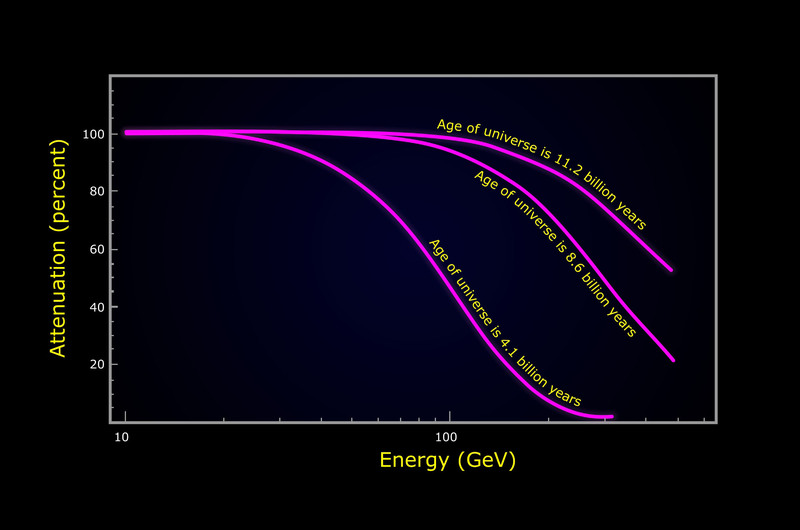 Once this occurs, the gamma ray light is lost. In effect, the process dampens the gamma ray signal in much the same way as fog dims a distant lighthouse. 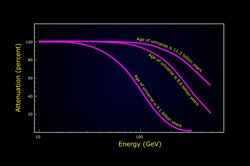 From studies of nearby blazars, scientists have determined how many gamma rays should be emitted at different energies. More distant blazars show fewer gamma rays at higher energies — especially above 25 GeV — thanks to absorption by the cosmic fog. From this measurement, the scientists were able to estimate the fog’s thickness. To account for the observations, the average stellar density in the cosmos is about 1.4 stars per 100 billion cubic light-years, which means the average distance between stars in the universe is about 4,150 light-years. “We’re very excited about the prospect of extending this measurement even farther,” said Julie McEnery, the mission’s project scientist at NASA’s Goddard Space Flight Center in Greenbelt, Md. Be the first to comment on "NASA’s Fermi Measures Extragalactic Background Light"